When I want true comfort, I think of a big bowl of soup. 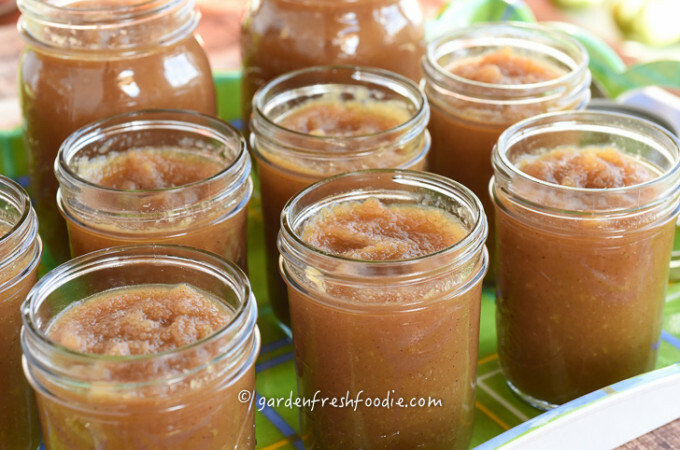 As fall temps start to dip lower, I gravitate to warming foods-don’t you? I purchase my squashes from local growers. You can get an awesome deal if you hit up the farmer’s market right before closing for the day. This is when the growers want to unload whatever hasn’t sold. That’s when I say-how much for the whole crate of squash?” I store the squash in my basement to have on hand throughout the winter. It keeps very well through about late February-March, or until spring greens start to re-appear, depending on cool your basement is. This soup is creamy goodness-minus all the badness in cream! Creating a creamy texture to soups is easy without using oils, or creams. Using veggies like squash, sweet potatoes, or red lentils, you can create a cream-like texture once they’re pureed. 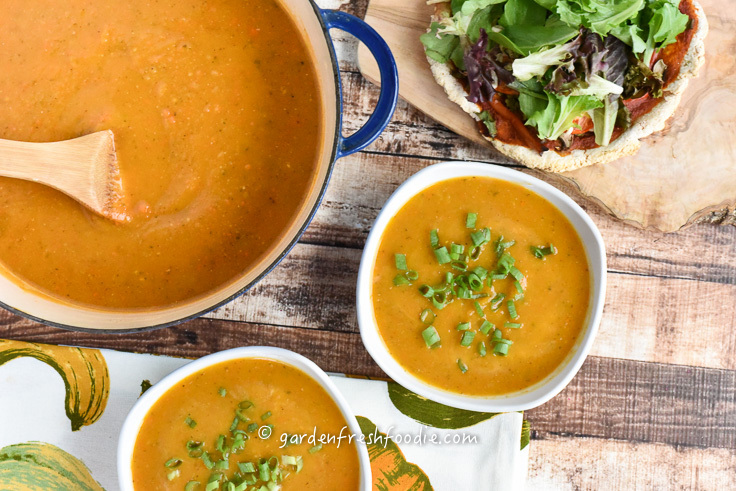 For a great cream-like lentil soup, make my Spicy Red Lentil Soup! 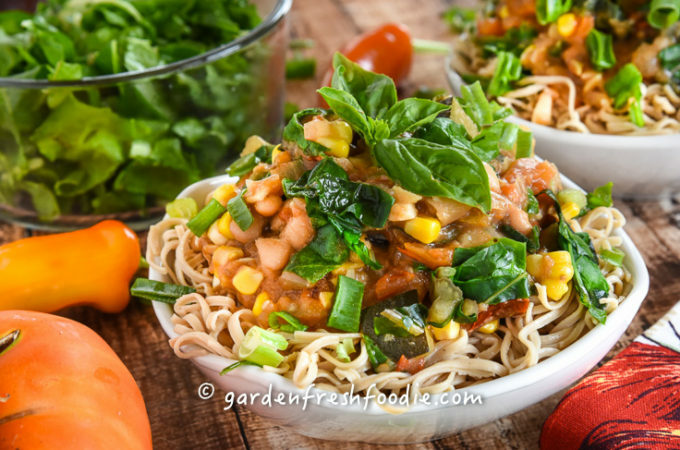 This soup also is sweet, not from refined sugars, but from the veggies themselves! 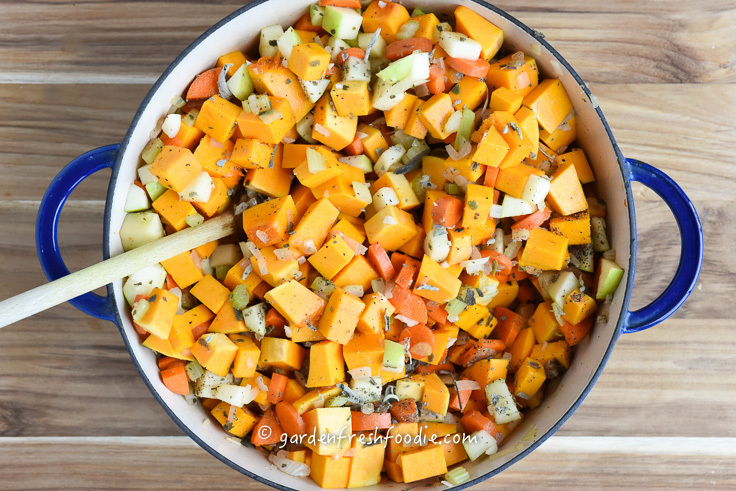 Carrots, squash, and apples, all blend perfectly to create a creamy, sweet texture that is perfect on a fall or winter day. I served it for a few meals. The first night we had it with make-your-own-pizza night (dough recipe forthcoming). The second, I served it with an awesome lentil pie, corn muffins, and salad. The sage adds a depth of flavor. I grow sage. It’s a perennial which dries amazingly well! Definitely grow some! It’s great in hearty dishes to provide a deeper, earthy flavor, and is perfect for holiday meals. In fact-this soup would be awesome on the holiday table, or served in small soup containers as appetizers! 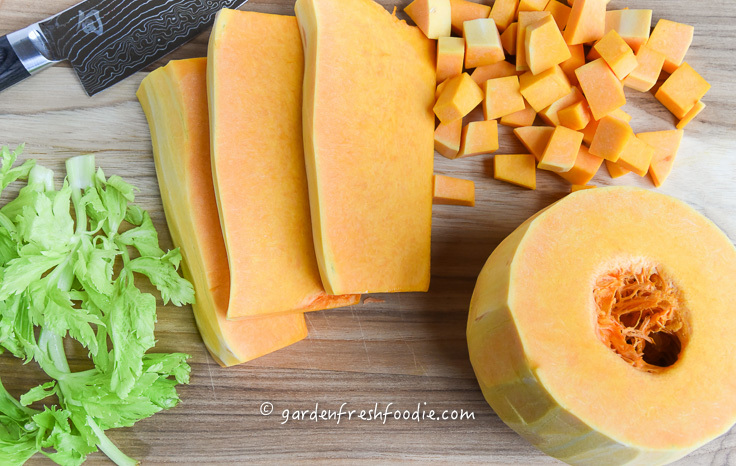 Squash is full of Vitamin A, a nutrient packed with anti-inflammatory benefits. It helps with skin, eye, bone & dental strength, as well as with healing, and lowering blood pressure. 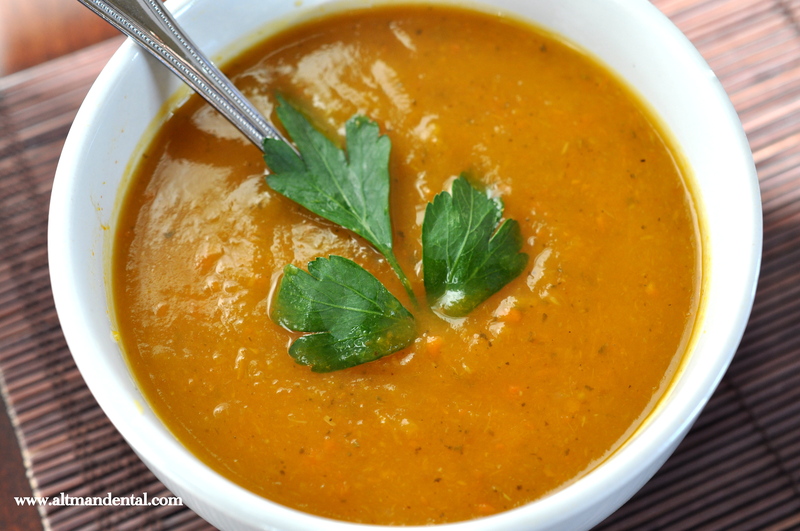 The addition of carrots, celery, and apples add to the already high fiber content of this soup. By using water to sauté, there’s no need to add any oil or fats. If you don’t feel like doing the sauté step, skip it all together! What you get is a soup packed with vitamins and nutrients, and loads of healing flavor-that’s it! This is one rock star of a soup! Place onions, garlic, celery, sage into pot, along with a few tbsp of water. Sauté until onions have softened. Alternatively, you can skip this and just add everything to the pot at once. 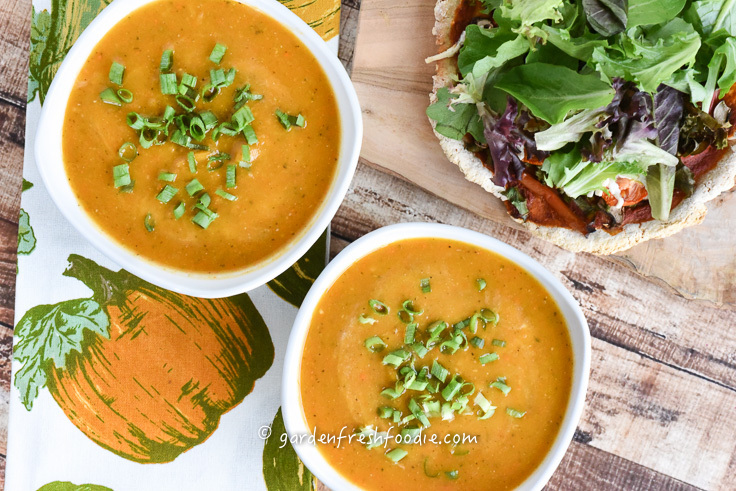 Using a stick blender (or a regular Vitamix) puree soup until creamy texture. If using a regular blender, be careful to vent, as steam could cause a build up in pressure and explode the top (we don’t want all of our hard work ruined with a squash covered ceiling! Best to do this in batches). Eat and enjoy, or freeze in quart containers for another day. We served this with pizza night and another time with corn muffins. 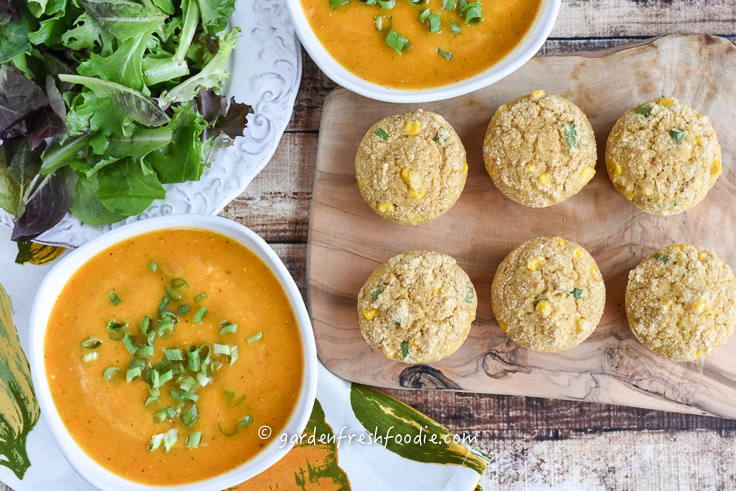 Using a stick blender (or a regular Vitamix) puree soup until creamy texture. If using a regular blender, be careful to vent, as steam could cause a build up in pressure and explode the top (we don't want all of our hard work ruined with a squash covered ceiling! Best to do this in batches). I made this tonight and it turned out a little on the bland side. I spooked at putting in 2 tablespoons of dried sage in, it just seemed like too much, so I reduced it to 2tsp. I ended up stirring some yogurt into it for a little boost, and it improved a bit more with cracked pepper on the top. Is the two tbsp of sage correct? Hi Sarah! I just looked back at the recipe, and noticed that it was missing the garlic it should have had in it. I add 2 tbsp of garlic to it as well, which totally would have upped the flavor. Yes, the sage really gives the soup the boost you are probably missing. Try sautéing the onions, garlic, and sage with a little water and then adding the rest of the ingredients. 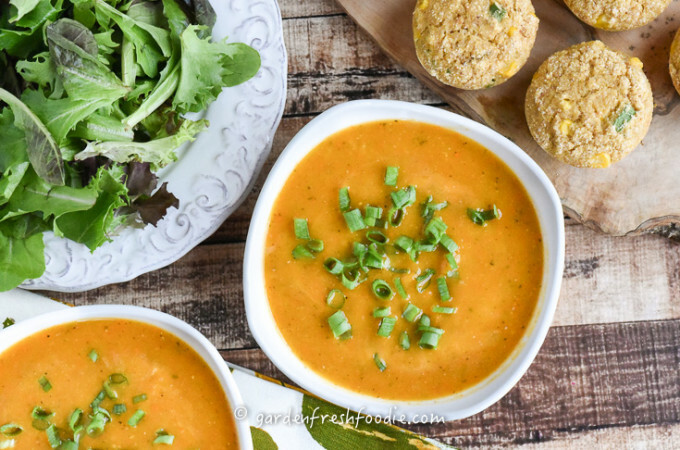 I’m going to remake this too-maybe this week, it’s one of my favorite fall soups, I have updated the recipe! Sorry for that missing ingredient, that was an older post! All my best! I just served this savory soup for dinner tonight using all 3 tbsp of sage. It was just spectacularly delicious ! Then I realized i forgot to add the 1 cup of almond milk. I did not like the addition of the almond milk, as it appeared to decrease some of the savory flavor of the sage. next time, I would make it without. Thanks Karen for your comments! Glad you liked it! Perhaps you used a vanilla almond milk that can change the flavoring. Cooking is a personal adventure! I made this soup today and loved it! 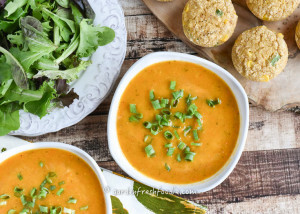 Butternut squash soup is one of my favorite soups. I’m always looking for vegan recipes that don’t include oil, so I was very happy when I found this one. A bonus is that it’s easy to make too. Thank you! Definitely making it again. I loved this recipe. I was out of onions and celery and had no carrots cooked, but I did have leftover roasted butternut squash I needed to use up. Even without the onions elery and carrots this was jam packed full of flavor. I kept mine on the thicker side and used it as a dip for some crackers, too. Definately a keeper. Thanks for sharing! Thanks Steph! So glad you enjoyed! I’m making the butternut squash soup for the first time, I was wondering if you use sweetened or unsweetened almond milk? Also, at what point do you use it in the recipe as I don’t see it in the instructions? The kind I have on hand is the unsweetened vanilla almond milk and per your reply to another comment that is probably not the one to use. Hi Sue! I always use unsweetened almond milk. Usually the vanilla. You add it in at the end if you feel it needs thinning otherwise totally omit it. Enjoy! Thank you! I did put a little almond milk in just before eating it and it was delicious! So glad to hear!!! 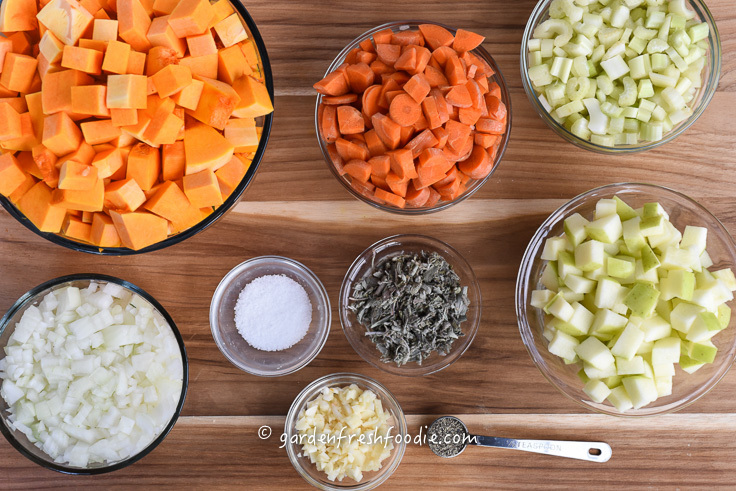 Soups are great to batch cook and freeze!